This book is gorgeous. Daniela Drescher is such a beautiful artist that I really wouldn’t care if there weren’t words to go with the pictures. As an adult reading this book, I want to jump into the story so I can interact with the glittery, charming world she paints. I can only imagine how magical it must feel for little ones. Growing up, I loved reading about enchanted worlds — and if I’d had it, I know this book would have been a favorite. 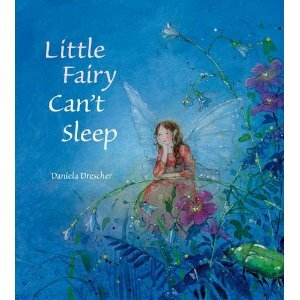 If I were being super-liberal, I’d take a small point off for the fairy being so tired at the end of the book that the moth-fairy prince carries her home….but this book is so sweet (a mother fox & her family, a father elf & his family, the sandman, a mid-summer night’s party!) that I don’t even care. If I’m reading this to my son at bedtime, when we get to the sandman page, he asks me to grab some magic dust from the page to sprinkle in his eyes. That’s how much this book comes alive. Gor-geous! This entry was posted in children's books and tagged books, kids, parenting on January 3, 2014 by skylikeme.